A 36-year-old man suffered serious facial injuries after being attacked by two men who forced their way into his home in South Lanarkshire. 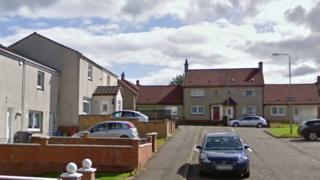 The attack took place at the house on Hawick Crescent, Larkhall, at about 15:10 on Friday. The intruders then ran out of the house and into a silver or grey Jaguar X-Type car. They were driven away at speed by a third man on to the town's Scotia Crescent. The injured man was taken by ambulance to Wishaw General Hospital and later transferred to Monklands Hospital. The first suspect is described as white, 5ft 6in tall, in his early 50s and of slim build with short dark hair. He was wearing black clothing. The second man was white and about 6ft 2in tall with shaved dark hair. He was in his 40s, of stocky or muscular build with tattoos on both arms. He was wearing a short-sleeved t-shirt and blue jeans. Det Con Ashley Hind said: "This was a very brutal attack on an innocent man." "Anyone who has the suspects or vehicle captured on their dash cam is also asked to contact police as this could prove vital in tracing those responsible for this despicable act of violence."